WHEW! I hope to have them done by year's end! I won't be able to visit Korea this year. Hopefully, some of you can provide me with recommendations for some good eats! FatMan, you will be missed! Billed (self-proclaimed) as the most Southern bar in the USA, this restaurant's claim to fame is probably true, especially since South Point is 500 nautical miles farther south than Florida. Attracted more by the sign than anything else, I had an idea that Shaka's would be a fun place to eat. As we pulled into the parking lot, there was just one other car parked in the lot, way off to the side. Stepping inside the restaurant, we were escorted by our waitress over to the bar area and given a booth right near the windows. I was surprised to discover that four of the other booths were already occupied. Filled with wood furniture and tile flooring, Shaka's felt a bit homey and it reminded me of my aunt's dining room circa 1975. After looking over the menu that consisted of stuff like sandwiches, salads, burgers and a few Tex-Mex style dishes, I decided to have a Shaka's basket. I ordered the cheeseburger with french fries (US$7.00). All the burgers are served with lettuce, tomato, onion and pickles and all baskets are served with french fries or home fries. When this basket was brought to the table, I felt like I had made a good choice -- a nice sized hamburger patty, melted cheese, a thick slice of tomato, lots of lettuce, a couple pickle chips and some red onions made up this monstrous looking cheeseburger. The verdict? The bun was light and fluffy, but the patty was dry and almost flavorless -- it seemed as though the patty hadn't been seasoned. In fact, we turned to each other in mid-bite, to see if the other of us felt the same way (we did). Even when I added ketchup to the burger, it had very little, if any, effect on the burger's overall flavor. The fries on the other hand, were done well. Light, crisp and free of grease, the fries arrived at the table hot and salt-free. My friend had a Shaka's basket as well - this was the mushroom and onion burger with home fries (US$7.50). Although the burgers looked good when they arrived at the table, we were in for quite a surprise when we actually bit into them. The food here was quite a disappointment, but the service was a different story. The waitress was helpful and friendly, and she stopped by every few minutes to refill our glasses and to chat. The food here was definitely not worth the price, but when you're practically out in the middle of nowhere, you don't really have much choice now, do you? Nice find, I've never even heard of Shaka's. I need to venture more out of central honolulu! not to be nitpicky, but i'm about 5 degrees latitude south of y'all. 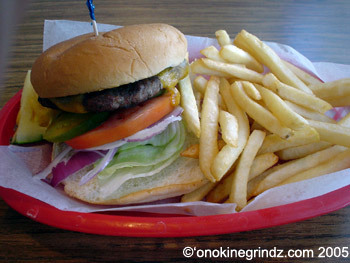 Wow, a $7.00 cheeseburger with fries in the small town of Na'alehu!!!! Not even a double burger. I guess Shaka's cater to the tourist and not the locals. I hope it tasted really good at that price. BTW, great story about it been the most Southern bar in the US. I guess someone in Guam who owns a bar/restaurant could take that "cool saying" away. I agree Clinton the Burger and fries look so tempting! Reid, did the burger and fried live up to the pictures??? I like eat one hamburger deluxe too now! Which fries tasted better? They both look sooo good. Reminds me of the burger I just had in Seattle last weekend at a place called Herfy's Burger. For about $5.99, you get a burger and a DEEP basket of fries that could have kept four people happy and bottomless drink. Burger was good, but the patty wasn't as thick as shakas. So Reid - Is this a "Tourist Trap?" 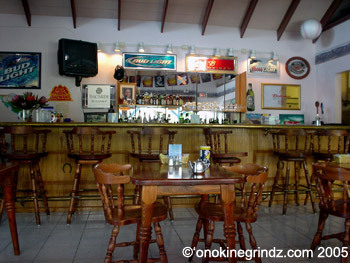 Shaka's is actually located near the southern tip of the Big Island in a town called Na'alehu. I don't feel that it's worth seeking out. I'll make sure they change their signage! Overall, I found the food on the Big Island to be a little expensive and this burger, although it looks good, wasn't really worth the price. I believe this place does cater to tourists who happen to see it. It is the first place you see on your way through the town if I remember correctly. Too bad the picture was not really representative of the food itself. When I looked at the photos again, I thought "Geez that does look good!" Too bad it wasn't. Nope. The burger didn't, but the fries were perfect! I believe so, but I did see some locals here. I guess there aren't very many dining options in Na'alehu. It's too bad really. That's a damn, dirty shame--a tasteless burger. It sure looked good in the pics. Next time I'm in the Seattle area, I'll try the 1/2 lb. burger at Herfy's to compare. There's another burger place I've been meaning to try in Bellevue called Burgermaster. They still have car hops like the good ole KC Drive-In or Burgerland...ahh yesteryear. You should have ate at the Na'alehu fruit stand. Cheaper and ono! I lived in Na'alehu for 6 years and it was my fave place to go. Deli sandwichs and pizza. I didn't eat at the Na'alehu Fruit Stand before, but I'll make sure to look for it the next time I'm in the area. I did eat at Punalu'u Bakery once before, and I found it quite expensive. This will probably be my last time eating at Shaka's too. Sorry you were dissapointed with your meal at shaka's but we don't add any additives to our food, so dont't blame us for the taste of the burger, blame the cow it came from. We sell 85-15 burgers so mabe we should get more fatty ones for people like you. As for our most southern signage, when Guam becomes a state of the U.S. instead of a territory, they can say they're the most southern. And also, when Seattle can find me an outlet for the same priced foods they get, I'll lower the price of our burgers. In the mean time, you try paying our gas and electric plus all the other over head and see how much you sell your burgers for in Seattle. Sorry again for your dissapointment in our burgers but our only consulation is we have also have a lot of happy burger customers too. Oh and thanks for the publicity, we can use all we can get even if it isn't all good. Aloha, from Shaka's. Ya know Ms. Bolton, I buy 85/15 burger and mine come out nice and tasty. A bit dry, but tasty. It's the cooks fault when the meat is tastless. As for advertising, I WOULD have visited your shop based on Reid's description. However, your nasty attitude has changed my mind. If I ever run to your neighborhood, I'll be sure to take a peanut butter and jelly sandwich! Thank you for stopping by the blog and offering your point of view. As far as my own cooking at home, I normally use ground beef that has only 7% fat in it and have never had a dry burger...ever. Besides that, I didn't feel that the burger had any flavor to it at all. When you say you don't add any additives, does that mean no salt, no pepper, no garlic, no NOTHING? If so, you should really state that on your menu. Hey Guys, you've already hanged me on the dry burger crime, could I at least have another opinion from antoher food critic. Who's game? Come on, even convicts get more than one juror. I'm happy for all the feed back. Thanks, Shaka's. Hey, I'm not perfect, so don't be fooled into thinking I am. And trust me, I've made my fair share of umm... "culinary mistakes" shall we say? ::grins crookedly:: Besides, I can't digest burgers well anyhow. Physiological thing that. Those frys now... I would love getting my hands on those babies! How do you make 'em? Years ago, I read an article about "The World's Best Frys" and supposedly they were cooked the "double dip" method, warm fat till cooked through, drained, then hot fat immersion till crisp. The fat used (this is kinda icky) was horse fat and was from around the kidneys. I've always wanted to try that... 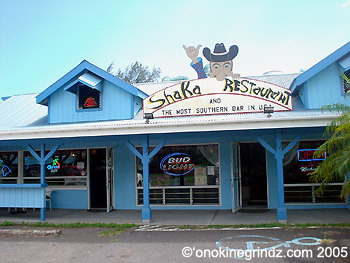 If I ever get rich, I'll do the world fry tour and start with Shaka's! I'm sure you have lots of regular customers who think the food is just fine. BTW...anyone want to visit Shirley at the most Southernly located bar in the US? She's giving you all an open invitation. A non-seasoned burger? What were you friggin expecting, gourmet? We had lunch there 2 weeks ago and are now back in PA. No complaints on the fare. Next time, get the opinions of the folks in the other 4 booths. What we liked about the area was the absence of the usual fast food joints. One thing I recommend is trying the other menu items. Burgers aside, when I had the pleasure of eatting there back in May of 2005 I had the Mahi-mahi along with fries and found it delicious. I tried my friend's chicken katsu and I do believe it is one of the best I have tasted. Maybe I'll try the burger next time I'm there in a couple of months, but it'll be hard to pry me from getting a full plate of that katsu. I do agree on the fries though. Wonderful! Hey guys next time you are in Naalehu do yourself a favor and try Hana Hou just down the street and to the right off the highway. Real homemade bread and buns not to mention the crazy good cream pies and desserts. They really know how to cook. Help my site by clicking on some of these links. Most of the newer photos on this site are being taken by this camera. I'm still learning how to use it, but I think the photos it takes are amazing. Though the lens I use often varies, many of the photos on this site are taken with a Canon EF 35mm f2.0 lens. A majority of the photos on this site were shot using this little camera. It was compact and discreet -- excellent for taking photos under most conditions. Sadly, it has recently died. This work is licensed under a Creative Commons License. All content on this website (including text, photographs and all other original works) is licensed under a Creative Commons License and may not be reproduced without expressed written consent.